Another little puzzle this week. If you like puzzles, you might like to also read my posts on The Two Egg Problem and the Tribute to Martin Gardner. You, and two equally smart friends, have colored dots painted on your foreheads (don’t ask why, the reason is not part of the puzzle). You are told that there are just two colors in use: Red and Blue . You can see the color of your two friends’ dots, but not your own. Suddenly, a masked man runs into the room, holding a gun. He orders each of you to raise your hand if you can see a Red dot on anyone else’s forehead. He tells you that if any of you speaks, or communicates any other information about the color of the dots, he will shoot you. He then tells you that you have one minute to determine the color of your own dot, or he will shoot you. If you correctly deduce the color of your own dot, he will set you free. What do you do in order to save your life? Can you work out the color of your own dot? Yes, you can work out the color of your own dot! First, let’s enumerate all possible combinations of dots. As we can see, there are eight possible permutations. The column on the far right of the table shows the number of hands that are held up for each case. Now we'll group them into collections with the same number of hands up. The first thing to note is that it is impossible for there to be one hand up. Thinking about it, this is obvious. If there is a Red dot out there, there have to be two people who will be able to see it! This is pretty easy. If there are no hands up, there are no Red dots. 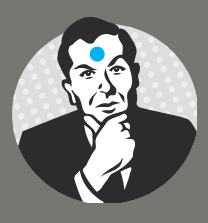 So you (and both of your friends) can deduce that you all have Blue dots. You're safe! 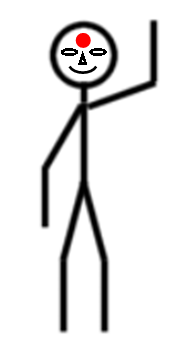 If there are two hands up, it means there is just one Red dot out there. Take a look around; if you can see it, you know that you can't have it, so you must have a Blue dot. If you can't see a Red dot, you know must be the one who is wearing it. You're safe again! OK, this is where it gets a little tricky. If there are three hands in the air, it can mean one of two things: Either there are two Red dots, or three Red dots. Another way to describe the situation is "There are at least two red dots"
Take a look around you. Do you see both a Red and a Blue dot? (The middle two rows in the table above). Since you know that there needs to be "at least two red dots", then you know you must be wearing a red dot. Safe again! The problem comes if you see two Red dots. What does this mean? It means that you could be wearing either a Blue or Red dot. What do you do? Well, this is where you are glad that your two friends are equally as smart as you, and that you are given a minute to deduce your color. If nobody announces their color after a few seconds have passed then everyone must be experiencing the same dilema as you. This can only occur if there are three Red Dots. (Anyone who can see a Blue would have announced that they have Red already at this point).